Maintenance is not just good practice. Without it, buildings kill and injure. The scandal is that no-one in Britain seems to care. 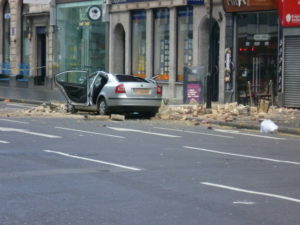 In February 2014, an unrestrained parapet weighing 1.5 tonnes fell 80 feet onto Julie Sillitoe’s minicab in Holborn, London, killing her instantly and seriously injuring her two passengers. Maintain keeps records of what we call “falling masonry” events. These are incidents in which part of a building falls off into the street, as a result of poor maintenance, causing deaths and serious injuries. Click here to download the current version. We estimate that these incidents have caused at least 11 fatalities, 5 serious injuries, and 16 slight injuries in the UK since 1999. Many more incidents happen – but mercifully don’t kill or injure. One press report in 2005 estimated that part of a building threatened to fall off in Edinburgh every two days. Victims have included a waitress in Edinburgh, a pedestrian passing Selfridges, a diner in a restaurant in Battersea, a tourist walking past a church in York, and two children being pushed past buildings in their prams. Maintain’s research “Putting it Off,” investigated why historic buildings are poorly maintained. Britain is a nation of building neglecters. Schools, hospitals, housing, businesses, museums, churches – all are neglected. The backlog for schools alone was estimated at £7bn in 2000 and £22bn in 2011. The reasons are complex. Building maintenance is unglamorous, routine work and provides no immediate payback. No-one advocates for it. It’s always the first budget to be cut. There are no fiscal incentives. The law is seriously inadequate. Yet maintenance saves money – and lives. It is not widely known that there is no general legal duty on building owners to maintain their buildings. Owners can be held liable for injuries and damage caused by defective buildings, but for most buildings, local authorities can only step in if the building is thought to be dangerous to the public – by when, in conservation terms, the building may be uneconomic to repair. Local authorities can require repairs to listed buildings or (after a complex procedure) conservation area buildings. But these are cumbersome powers which are little used except in extreme cases. There is one exception – which hardly anyone appears to know about. Workplace Premises must be maintained and inspected – but who knew? Buildings which are workplaces are legally required to be structurally sound and be properly maintained. Click here to download Maintain’s Workplace Briefing Note on this legal duty, which is found in the Workplace (Health, Safety and Welfare) Regulations 1992 . This requires, in effect, a regular “MoT” inspection for workplace buildings. Unfortunately, few owners or surveyors seem to be aware of it and the HSE has made little effort to publicise it. So does anyone get it right? The Church of England has a 5-year inspection system, but it doesn’t work well because much of the recommended maintenance work is not done. We estimate that its 14,000 listed churches have a repair backlog of £1.5bn, rising at £70M a year. In the USA, nine cities, including New York, require owners of high-rise buildings to carry out regular professional inspections on their facades, file reports with the City Council, and promptly correct faults. A similar law operates in Quebec. Many other places in the USA have what are called “minimum maintenance codes”. They simply prescribe a standard of maintenance that all owners of all buildings in a designated area must adhere to – for example, by requiring that all rainwater is directed into a gutter. Enforcement is via a process equivalent to issuing a parking ticket and the local authority can carry out works if the owner fails to comply. Click here for details of the Code applicable to New Orleans. In the Netherlands and Flanders, selected historic buildings get a subsidised annual check-over by skilled workmen, and a similar system is now being trialled in Stirling. Have a look at our page What You Can Do. Please tell us about any falling masonry incidents of which you are aware. At the moment, we rely on media reports and there may be further incidents that are not widely reported. Address them to: chair@maintainourheritage.co.uk or via the Contact Us page.